The tires on the rental car crunched on the gravel as we pulled into the parking area. We could see the lights on in my mother’s first floor apartment, a sign that she was waiting up for us. My brother and I had spent the day flying to the Eastern Shore of Maryland from California where we lived. We came to sort out why my mother had collapsed on the sidewalk and could no longer walk. She was later diagnosed with a brain tumor. Aunt Millie greeted us at the door, since she had been staying at the apartment to nurse her sister, our mother. We weaved our way through an overcrowded living room to the back bedroom where my mother lay. I had last seen her one year ago, and she had shrunken in size and spirits since then. At her bedside we kissed and hugged, trying to seem brave and cheerful in the face of what was transpiring before us: she was dying of cancer. Her final passage at the end of her life was as peaceful as we could make it. Having been a nurse, she knew her body was winding down, and she accepted this with grace. True to form, she cared more for those around her than for herself, so she bore her sorrow with great dignity. We had her readmitted to the hospital for palliative care, and we contacted her siblings to come visit her there. Her older brother, my Uncle Bill, met me in the hospital’s waiting area. While my mother slept, he and I sat on the red vinyl sofa, speaking softly about her condition. Uncle Bill grew quiet, folded his hands on his lap, and contemplated his fingers. He stood up slowly and walked toward the window, which looked out on a massive elm tree whose lush green branches extended toward the building. “Oh, yes… the day she was born was a special day in May,” he said. His back was to me as he addressed the tree outside the window, his voice growing deeper and richer in tone as he recalled that day. Uncle Bill was an extraordinary storyteller. After she died, a crew of family members courageously sorted her belongings at her apartment. She was a saver, but most of her treasures were destined for the thrift shop. Of all the items that I came across, including childhood drawings, photographs, and other mementos saved by a loving mother, there were three significant things. She kept every letter I had ever sent to her over a thirty-year period. She had a box of many white kid gloves, elbow-length with pearl buttons, the kind of gloves that would be worn in another century with a full-length fancy dress. I kept both of those boxes. The third box held something that I could not keep, even though it took my breath away when I opened the box. Inside was my hair. Until I was thirteen years old, I had never had my hair cut. My long blond ponytail reached my waist. She had kept this remnant from my youth like a relic preserved in a box. One year later, I travelled to Kyoto, Japan, on a textile tour. It seemed fitting to make this trip, since my mother and I had shared a passion for sewing. She made most of my clothes, picking out the patterns and fabrics with me. When I was old enough, she taught me how to sew and gave me a sewing machine. I felt she would be looking down on me as I visited kimono designers and ikat dyers in Japan. 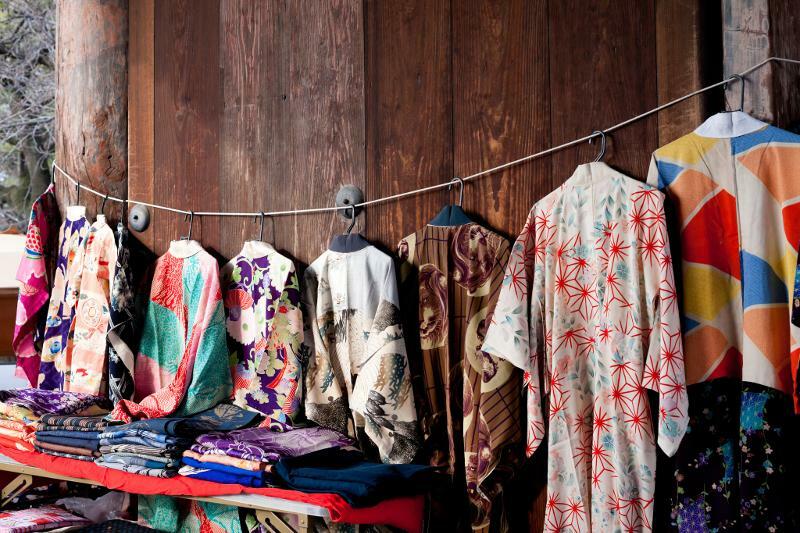 As I wandered through a flea market in Kyoto, I saw many old kimonos and obis for sale in the stalls. I was told that the Japanese are superstitious about wearing a dead family member’s clothing, so the clothes are sent to the flea market. I thought of the box of my blond, wavy hair that my mother could not bear to throw away. Since then, I’ve tried to travel lightly, without too many possessions to weigh me down. But no doubt, once my life is completed, there will be a raised eyebrow, a shrug, a little laughter, as others sift through the things I have chosen to carry on my journey. I still have the box of gloves.